A new study reveals that when your appetite is whetted, you're more likely to impulse buy, reports EurekAlert. Scientists have discovered that a delectable aroma can make you purchase something you can't really afford: Female study participants in a room with a hidden chocolate-chip cookie scented candle were much more likely to make an unplanned purchase of a new sweater — even when told they were on a tight budget — than those randomly assigned to a room with a hidden unscented candle (67% vs. 17%). What is it about the human brain? Do yummy smells put us in such a good mood that we're willing to throw caution to the wind? 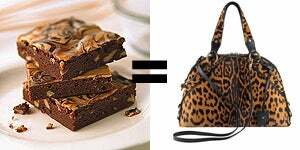 And, just for a moment, think about what retailers could do with this information: Will Gucci start baking brownies? Will Wal-Mart start pumping the scent of French-fries into stores? Will all of Las Vegas reek of Bundt cake? Stores really need to do something to lure shoppers in: According to the Wall Street Journal, MasterCard is reporting a surge in online sales, especially in luxury goods. But the next time you're shopping online — from the comfort of your own home — ask yourself: Do I really want that YSL bag, or do I just smell that dinner's almost ready?